We encourage collectors to showcase their exhibits and allow others the opportunity to view, and learn from them. The American Philatelic Research Library has more than 800 exhibit reproductions, more than 100 of which are digital scans. As we receive permission, we will post exhibits here to be viewed. .
Share your Exhibit - Interested in donating a copy of your exhibit to the library or making it available on the APS website? Click here for more details. 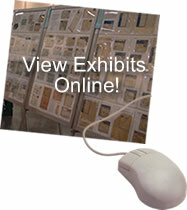 Learn more about Exhibiting - Want to learn more about how to exhibit? Click here for tips and links to get you started. Search through all of our Exhibits - Want to search or borrow other exhibits that are available from our Library? See details. Where else can I find exhibits online? Many Specialty Societies have exhibits on their websites.